As predicted in an earlier post, this week has shaped up to be highly profitable for Atlas Line™ users. 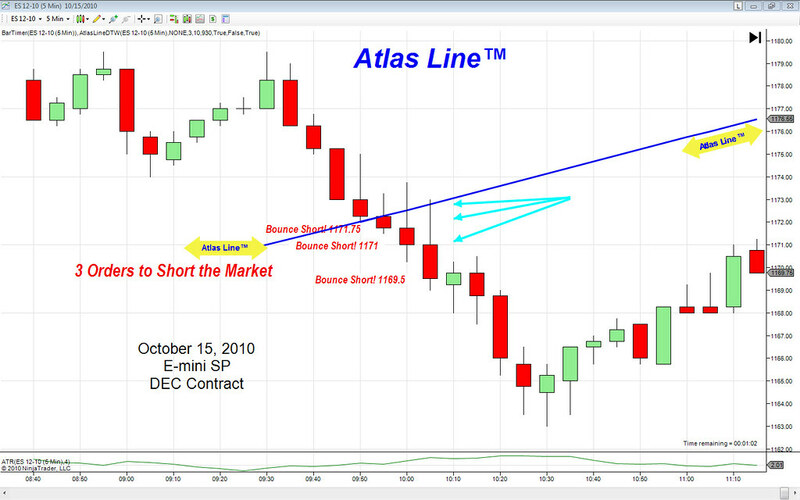 Three Bounce Short order signals were given in quick succession, combined with the Atlas Line™ intersecting price. Since the Atlas Line is an excellent filtering tool, this double confirmation technique is far superior to trading with standard indicators. If you considered the constant angle of the Atlas Line™ and the signal generated at 111.75, you would have had five points in your pocket, easily. With the holiday season approaching (and the end of 2010), the markets are becoming increasingly more volatile. Now is the time to learn how to use the Atlas Line™ so you can benefit from one of the best trading times of the year, the December contract. Does this also work on the Forex? thank you for always posting new information mr paul. i recently started using the atlas line for trading the emini s&p es contract and it has kept me out of some losing trades, helps me increase winning trades, even when volatile!!! please advise when you will have another webinar.